How to Write Amazing IEP Goals (and take Data like a Boss)! 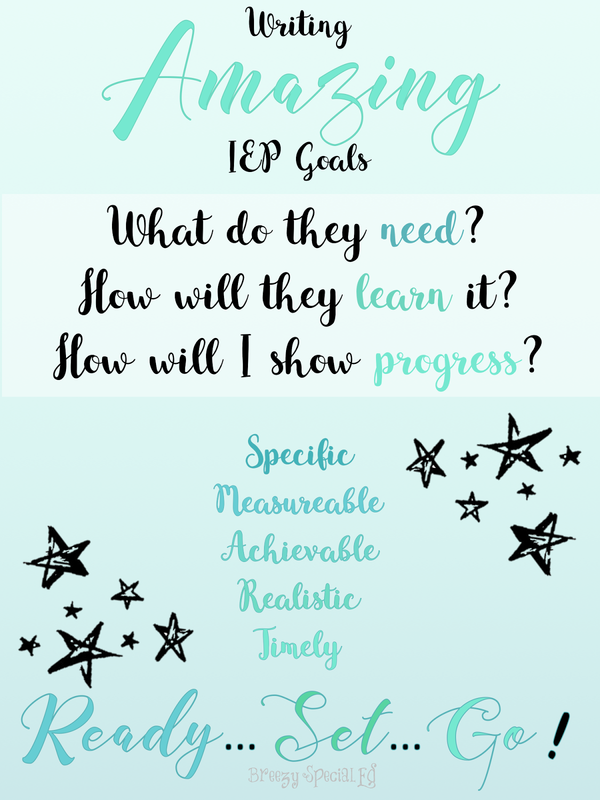 How often have you gotten a new IEP goal and thought, how in the world am I going to track that? Or even worse yet, wrote an amazing IEP goal only to later realize you aren't really sure how you were going to collect data on that goal. Been there, done that. My first year of teaching I found myself writing really good IEP goals that were specific and described how students needed to grow...but sadly I found myself unable to keep track of their progress as detailed as I would've liked. Sure, you can read a million different ways to collect data and maybe you've tried them all: clipboard, notecards, binders, and the list goes on. 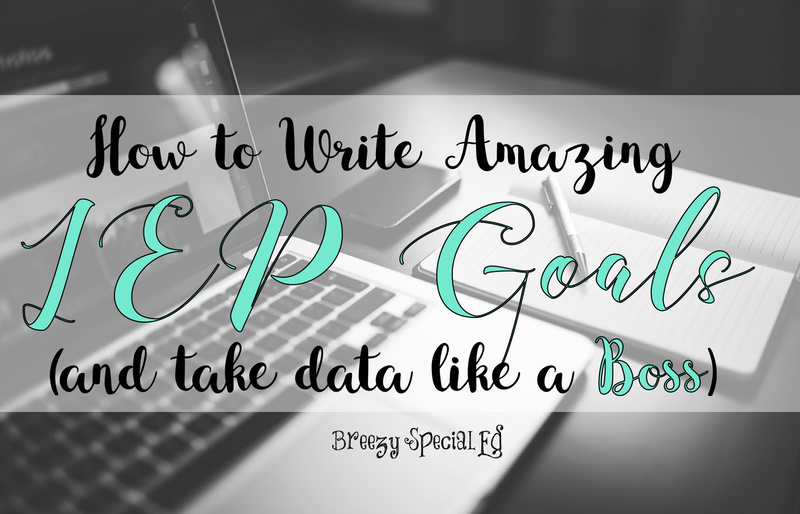 But your data collection might not get better until you make your student's IEP goals work for you! 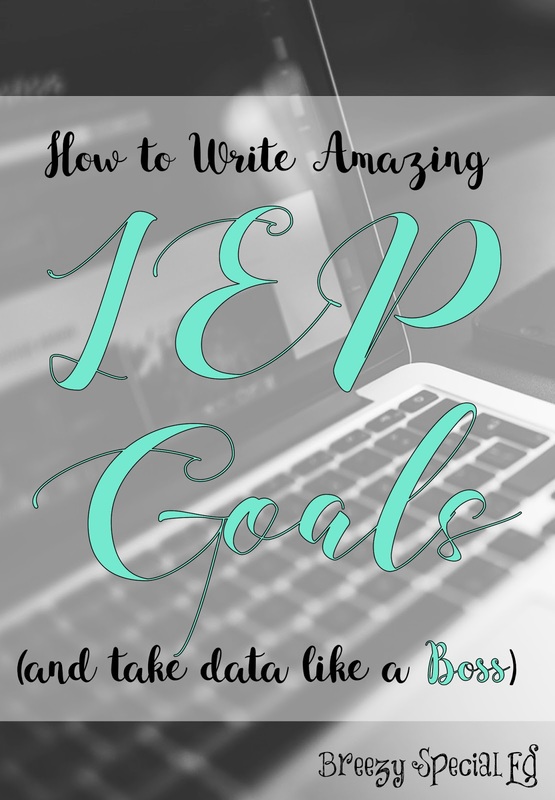 Here's how to write the best IEP goals that you can also track easily and effectively! 1. What does this student need? This is the most important question. Why work on a skill if it isn't going to help the student succeed in the future?! What academic skills are you working on with this student? Or what life skills does this student need in order to be successful? Here's a few student examples from the most common goal areas (I typically include a ELA, math, life skill goal, and then the last one varies based on student need). English / Language Arts: Anna is working on journaling. She is a rock star at copying sentences, but when given a sentence starter she has no clue how to finish it. I would love for her to work on her journaling skills and be able to complete sentences using her own thoughts. Math: Ben struggles with recognizing the values of bills and coins. Since he is in high school, we are going to focus on bills and using gift cards as he will be using those most often. Ben participates in a weekly classroom store where he can spend classroom money, occasionally buys lunch at school, and goes on monthly community trips where he may or may not have opportunities to buy items. Life Skills: Caden is very prompt dependent. He can complete a task if he isn't distracted but will not move onto the next step on his schedule without a staff member giving some type of prompt. English / Language Arts: Anna has a journal station built into her schedule each morning. She works in a small group with 2-3 students and a paraprofessional or myself, and will use these errorless leveled journals daily during journal time. Math: During his direct math instruction, Ben will work on recognizing bills using a variety of method including worksheets, play money, file folders, and task cards. Since the classroom store is weekly, he will participate money exchange there. Since he doesn't buy lunch all of the time and I'm not sure how many opportunities will be available in the community, I won't list those places in the IEP. 3. How will you collect the data? English / Language Arts: Anna's journals are stored in a binder. Since I check her work after she is complete, it will be easy for me to check off a couple boxes on a data sheet, but I won't have a lot of time to write since I have multiple students in this station at once and she doesn't have a designated paraprofessional. It would be easy enough to collect data daily, but also not necessary. I will aim for data at three time a week. Math: I don't need to collect data on everything! I will let the file folders and worksheets be practice only, and keep data on the direction instruction time that I have with him using the fake money that looks real. I should be able to track data each time we work on this skill, and I will aim for once a week. Life Skills: Since Caden has a 1:1 aide, I will let her collect the data for this goal. The data sheet should include the steps on the consistent mini schedules we use and a space for the aide to write what prompt Caden needed (abbreviating V for verbal, G for gesture, + for independent, etc). The aide should be able to track each of these daily, and the data sheet could show a couple of weeks on one page. Now, write that goal! Now, every school has specific requirements and thoughts on how IEP goals should be written. After talking with my team at school, I usually ended up writing general goals such as: "By ______, Ben will demonstrate increased skills in the area of functional math as demonstrated by the following objectives." And then each objective was extremely specific and what many people would call an IEP goal in and of itself. So the examples that are following were actually objectives, but if you are required specific goals, the examples below would be perfect and their objectives can always be leading up to that goal (with 60% accuracy, 75% accuracy, 90% accuracy). As you probably already know, make sure your goals (or objectives) are Specific, Measurable, Achievable, Realistic, and Timely. Given sentence starters, Anna will complete a journal using options or her own thoughts with 100% accuracy, 5 out of 5 trials. Given a variety of bills, Ben will match/identify A) one dollar bill, B) five dollar bill, C) ten dollar bill, and D) twenty dollar bill with 80% accuracy, 4 out of 5 trials. Given a picture schedule for a task with multiple steps (such as work boxes or hygiene routine), Caden will complete all steps of the task, moving from one task to the next without additional prompting from staff, 80% of the time, 4 out of 5 opportunities. And that's it! Hold your IEP meeting, collect your data, and life is GOOD! I hope you found some of these ideas helpful. Need a visual reminder at your desk? Here's a free printable for you! Happy goal writing! Thanks so much for sharing. I have been struggling this year with making sure my goals are easily measured and making sure the goals are what the student needs. I like to write a goal and then create work samples and data sheets to make sure I can really measure what the goal is asking. This helps me already have what I need to get started on the new goals right away. Any examples of a visual arts goal you might have to share..
Hm, my first thought is why a visual arts goal? Why is it something the student needs? That is how I learned to write goals, but in the district where I work now, they do it oddly. First of all, instead of saying "Given 10 math problems," or "Given a schedule," they say "Given specialized instruction." Every time. Also, they don't use objectives. I still can't get used to writing goals that way! We are required to write four goals for our transition kids (18-22). Language Arts, functional math, Independent living and vocational. I usually throw in a social skills goal for my autistic kids or others that need it. What program do you guys use to write your goal? We are currently using Siras at my school. Sounds very similar to what we include as well. Miss Butterfly, every place is different! So tricky. Very interesting that they don't even use objectives! We only use objectives for pre-school, students taking an alternative assessment and when the IEP team decides they are necessary. My goals always have to be complete at the top (I.e. Jason will be able to answer -wh questions) and if there are objectives it would be objective 1 answer who questions, objective two answer who and what questions and so on). Weird how different it is! This is my first year teaching. 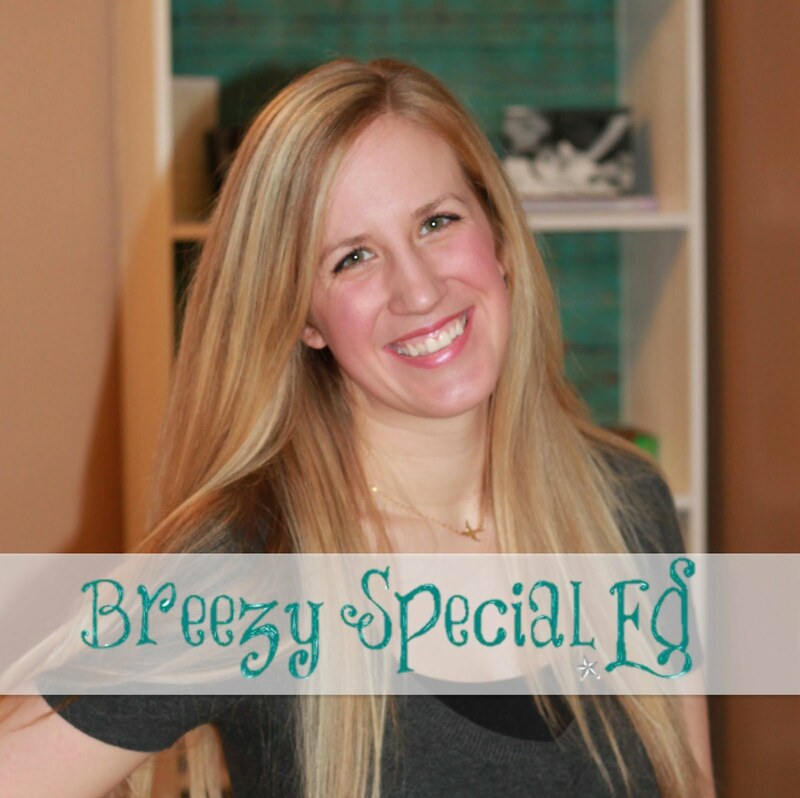 I too find myself overwhelmed with the concept of drafting an IEP. Thanks for the advice. 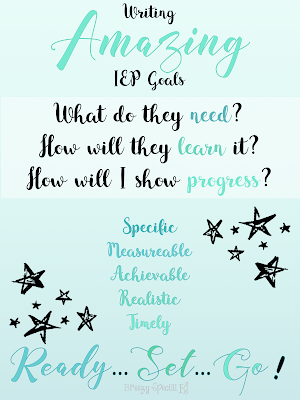 I have been a Special Education teacher for fifteen years, and I really wish I had someone like you to share info about your experiences and advice in writing IEP goals. I also appreciate your positive tone. Our field can be quite negative at times, so your blog is very refreshing.